Second-screen iPad app Astropad has today launched a new premium version of its drawing suite called "Astropad Studio" that's been built exclusively for the iPad Pro (via TechCrunch). The new service offers users a number of advantages over the basic app -- including 40 MB/s max speed for lower latency, deep Apple Pencil integration, and more -- for a subscription plan of $7.99/month or $64.99/year. Similar to the original app, Astropad Studio works with any Mac app via Wi-Fi or through USB and mirrors drawing tools from the iPad's screen onto a connected Mac. 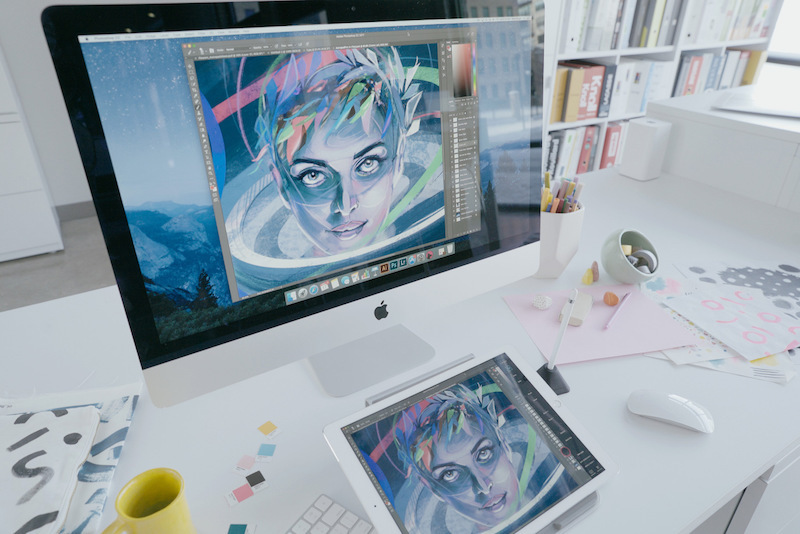 The company says that this connection lets users gain control of "pro-level drawing tools" on a Mac, and is aimed at creative professionals who work both in an office and from home. One of the biggest additions to the Studio suite of features is support for what Astropad calls "Liquid Extreme," which includes color-corrected output and retina resolution. Essentially, "what you see on your iPad is the same as on your Mac," according to the company. The list features "Magic Gestures," which Astropad says is a way for users to set up easily accessible controls using a finger and Apple Pencil combination. For example, users can set up an erasing function to activate by setting one finger on the iPad's screen to instantly turn the Pencil into an eraser. Two fingers can be a right click, and so on. The standard version of Astropad sells for $29.99 on the iOS App Store [Direct Link]. For the new app, users can try out Astropad Studio [Direct Link] with a 7 day free trial before deciding to subscribe to the service's monthly or yearly models. More information regarding Astropad Studio can be found here. Nope. If you have a subscription model you won't get a penny out of me. Ugh, everyone is following this drug dealer business mentality (called subscriptions) now days. As long as the ipad pro misses the first quarter inch of each apple pencil stroke, it's useless as illustration hardware. Which it doesn't, so it's not. Good thing we got that out of the way. Have the one off payment version and that will have to do, no way am I paying $65/year. I got to beta test this over the past month and it is pretty awesome. I think the subscription route is ridiculous though and I won't be a part of it. They did claim in their beta email that they won't touch the original (already pretty expensive) app, but we'll see I suppose. This makes me want to break out the old Xcode and make a free knock-off, which maybe I will. [doublepost=1484155699][/doublepost]I wish [USER=48511]@Apple[/USER] would just nativly support screen mirroring/secondary display with the iPad Pro with the Mac via USB C. Hopefully thats comming this year. It just doesnt make any sense for them to continue pushing lightning . The worst part about this is requiring an additional payment for low latency. That's if they leave the $20 app alone and don't transmogrify it into the recurring subscription app. I was interested in Astropad... until this subscription nonsense. I will NEVER subscribe to software.